Always reckoned you could have 'made it' in Formula 1? Okay, big shot, why not install a simulator in your shed, and find out?Motorsport Simulators recently got in touch with a press release festooned with key buzz phrases - 'ultimate boys' toy… used by professional racers… same technology used to train Tornado fighter pilots… feeling the thrill of going from 0-100mph… in the comfort of your own home.' Who could resist? Not me. Turns out, it's not as easy as you'd think. I had the chance to try out one of Motorsport Simulators', er, simulators, driving a few laps of the iconic Silverstone circuit, and it turns out the simple action of shifting gears and braking at the same time is enough to put you into a massive spin. After setting what I thought was a half-decent lap time, I then watched as professional drivers Jason Plato and Daniel Ricciardo then instantly chopped five seconds off my time, suggesting that this would need a bit more practice. Luckily, Rory 'Hot Wheels' Buckeridge already did this article, so you need read no more about my attempts at driving. But what if you could have one of these F1 simulators in your own home? Is such a thing feasible? 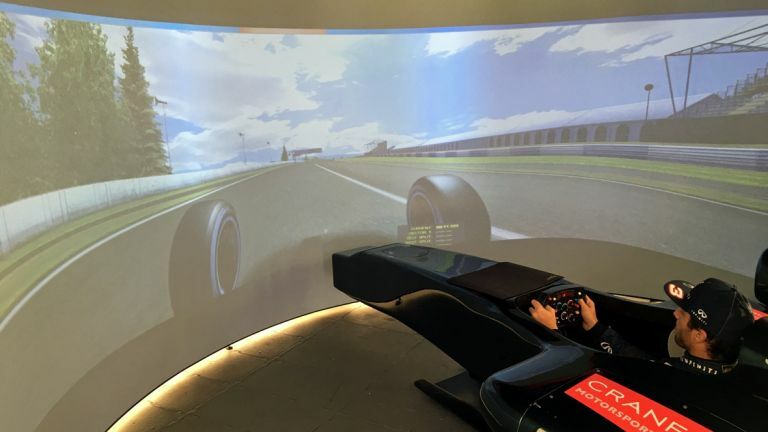 I spoke to Motosport Simulators' director Patrick Ward to find out if you could ever get this kind of machinery in your house. What you get is perhaps simpler than you'd expect: half a carbon fibre, F1-esque chassis with a screen in front is all that's needed to offer the experience. You're strapped into the claustrophobic cockpitwith a seatbelt that inflates as you accelerate, in front of apaddle-shift steering wheel. The wheels aren't there, for obvious reasons, but are presented virtually to give you the feeling of really racing the car. There are various options for the simulator, ranging from a 'simple' three monitor setup and chassis to a huge, four metre wrap-around projection screen with three projectors working in unison to give a really immersive feel of driving the F1 car and, probably, an electricity bill the size of Watford's. All of them run on a surprisingly svelte system, with a Core i7 CPU and a paltry 4GB of RAM. It'sthe sort of high-end-but-not-crazily-so PC that many of you might have in your own gracious home already. The extra power needed comes from a pair of 4GB GTX graphics cards to keep the graphics smooth, but it was really surprising to see how little grunt was needed to power this massive machine. The base level (which I failed dismally on) only offers feedback through the steering wheel, simulating feedback from G-forces and rumbling when you head off track or over kerbs. If you fancy paying a little more then you can upgrade to an entire chassis that shudders and moves alongside the game, ike a more advanced version of what you'll find in an arcade, if you still live anywhere near an arcade. If you've got further cash to burn, a moving seat with a design based on aerospace engineering, provides an even closer simulation to a real race environment. "This system is used by a couple of the Formula 1 teams. They use specific upgrades for racing purposes – but this is the nearest you'll get to an F1 car,” Ward tells me. “They spend a lot more money on the monitor systems, the quality of the software, their requirements are different to the enthusiast. They'll want to check tyre pressure, tyre wear…the whole thing. They do it for a lot more technical reasons. “Simulation is become so much more important as their track time for testing is so limited, so they're investing in simulation to offer a cheaper option than track time." But what if that's not enough for you? What if you're so inspired by this idea, and are desperate to have your own simulator, but you've only got space for a cinema room? Turns out there's a solution for that as well. Ward tells me the company has found a way to hide the simulator under the floor, with a button raising the chassis up and into the main projection area. So what's the cost overall? The most basic setup is a, ahem, highly affordable £35,000, but, Ward warns, "The top-of-the-line equipment comes in at £75,000." Apparently, this setup has been sold a few times, but presumably only to Premier League footballers, hedge fund types, and the presidents of certain countries. And the one that pops up out of the floor? That was such a custom job, there wasn't even a price attached: if you have to ask, you can't afford it.